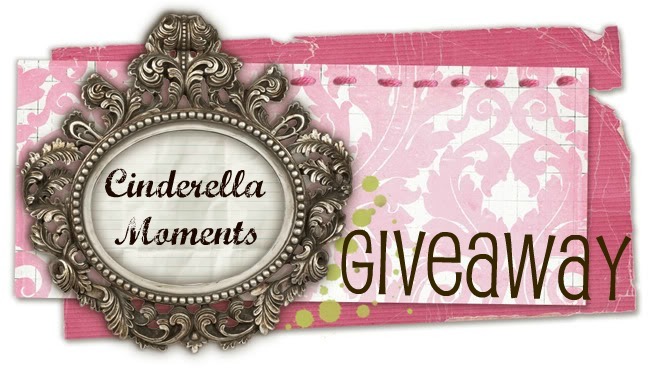 Cinderella Moments: My first GIVEAWAY! I have wanted to do one of these giveaways for a while now. So here it is as a special thanks to everybody. 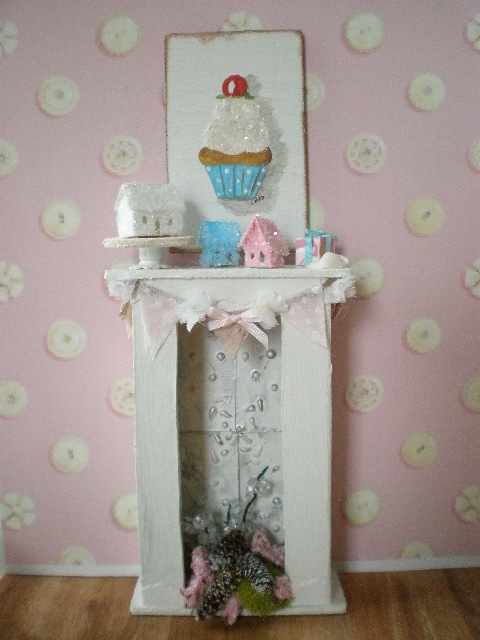 I made a Victorian style shabby chic mantel. Everything is handmade. 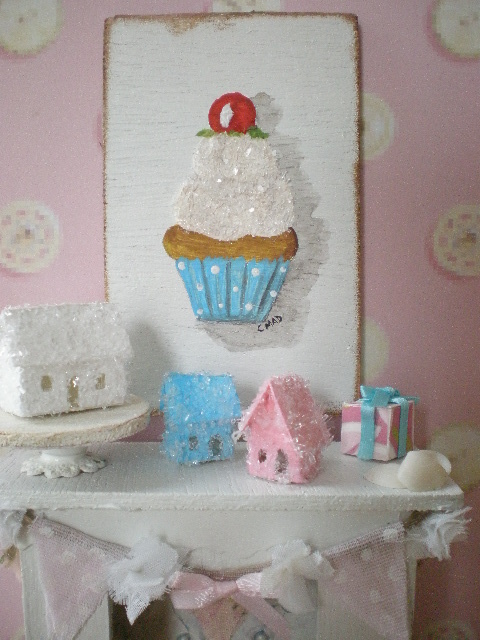 The cupcake is an original painting. 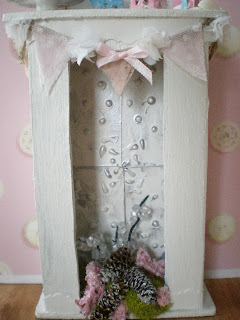 The glitter "Putz" style houses, present and 3 seashells are all glued to the top. The fabric bunting has tiny white flowers and a pink bow. I made "tin" tiles for the inside of the fireplace and included a floral arrangement on moss for an extra romantic look. - You must be a follower of this blog. - Leave a message under this post so I know you're interested. - For additional chances to win post my giveaway on your blog and leave me a second message telling me you did so. - Like my Facebook page: Cinderella-Moments and leave me another comment telling me you did so. The winner will be announced November 30. The winner will have 3 days to respond. If no response is received another winner will be announced. What a gorgeous gift! Count me in for this giveaway. Soooo pretty! Your minis always are :) I have been following your blog for quite awhile now and I love your style. Ö Por favor... may I come in? Lo publico en la "sidebar"
Absolutely gorgeous! Please sign me up for a chance! I just "liked" your page on facebook! So I get a second chance? How cool is that! And I'm heading over now to post on my blog about your giveaway! Good luck to everyone! How cute...I love it!!! You do amazing work! I am following your blog. 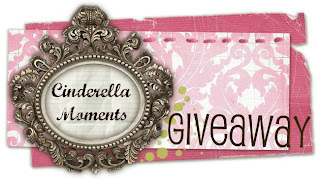 I just posted your giveaway at the very top of my giveaways section on my blog (right side-bar)! ...and I also follow you on fb!! I'm a FB follower as well. Going to post your giveaway on my blog now...not that I want everyone to know because I want to win...hehe!! I love your fireplace and the putz houses are adorable. Thanks for the chance. What a wonderful giveaway! Please include me!! I've just clicked on the 'like' button for Facebook. I wish I could do a link on my blog for you too but I haven't quite worked out how.....! Me encantaría participar en tu precioso sorteo. Fantastic giveaway! Count me in, please. Count me in would love this fireplace for my shabby bedroom. I've put photo and link on my blog and I liked you on facebook. 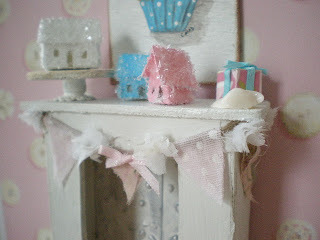 I love style shabby chic !!! Your work is very beautiful! thanks for this opportunity and please count me in your draw!!! PLEASE count me in on this incredible giveaway! I LOVE your mantle and how you have decorated it! Please enter me in your fabulous giveaway. Thanks. I am a follower. I am following you on Facebook. Please enter me again. I announced your giveaway on my blog. Please enter me again. I love your work. Thanks. I put your link on the side bar of my blog. Un sorteo precioso,cuenta conmigo.Lo pongo en mi blog. I'd love to participate in you lovely giveaway and I put the link on my blog too,miniregards. Oh yes! Please include me! 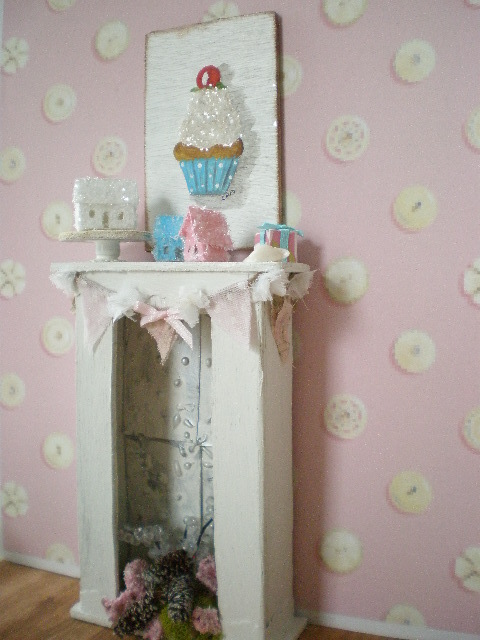 Lovely mantel. What adorable giveaway, Caroline! I love your Victorian shabby chic mantel so much! So please count me in. So now I'm very excited !!!!!! I would love to enter your giveaway! Please include me! me gustaría participar en tu sorteo, el regalo es preciosisimo, cruzare los dedos hasta el día del sorteo. Caroline, ya te he publicado en mi blog, que todo el mundo se entere. como María Luisa Vera, ahora te pongo un comentarío. Casi me pierdo tu sorteo por culpa de mi "maldito" ordenador. Hola ya tienes otra seguidora mas, apuntame al sorteo, es precisos, besos. Pongo el enlace del sorteo en la barra lateral de mi blog, besos. I have been a follower of your blog and I now "Liked" your Facebook page adding your post to my page also! I am back after posting your giveaway to my blog! Good luck with your new followers, I know you will have many your love you as I do! I put your link on my blog's sidebar. Es un regalo precioso. Por favor, cuenta conmigo para el sorteo. I wasn't able to become a follower on your page - not sure why - but I linked you from my blog! Guauuu es un precioso regalo¡¡¡ cuente conmigo por favor¡¡ soy incapaz de poner los sorteos en mi blog ¡¡ lo siento pero soy torpe con el ordenador , un saludo, Angeles. Por favor me encantaria participar es un precioso regalo. Gracias, un abrazo. This is a wonderful giveaway. Please count me in. 3. chance: I put a link to my blog. 4. chance: I will cross my fingers. International entries are allowed. Shipping is totally covered so don't worry. I am a follower and would love to be part of the give away, your art is sublime! What a gorgeous giveaway please count me in. Good luck to everybody! With help I was able to add you to my format on my page! Me encanta y me gustaría participar. Ya lo he subido a mi blog. Subo el aviso a mi blog encantada en la barra lateral. Tambien estoy de sorteo por si quieres apuntarte. Please count me in too,i will post your give-away at my side bar of my blog. Hello! I just found you through Pinterest. I love your little cottages, visited you etsy shop, and now I am a follower. My fingers are crossed for this sweet giveaway. Thanks so much! Para mi ya es un regalo conocer tu blog♥ y ser tu seguidora!!! You of all people know how much I love love love your work!!! I'm already shopping for my next Caroline original. I was showing my mother in law your incredible work & saw this generous giveaway opportunity. Thank you for the chance to collect more of your special work! Please include me in your give away! I love your work. :) Amy. Hi Liliam! You can translate the page into Spanish by pressing the top translate button. It's the very first thing at the top of the right column. If you push the translate button all the languages will pop up including Spanish. Thanks for coming by Liliam!